It is no surprise that Liesl Gibson's first book, Little Things to Sew was highly anticipated. It promised all the detail and clever styling that we have come to expect from her and her team at Oliver+S. Happily, they have made good on their promises! The book contains full pattern sheets for 20 toys and accessories for children. While some of the projects are skewed for very little people, there are many projects aimed at or adaptable for older children, too. This is the Red Riding Cape the larger of the two sizes. This pattern pretty much takes care of costuming (fairy tales, dark and stormy super heroes) and fancy dressing (Easter! Tea parties!) for the foreseeable future. 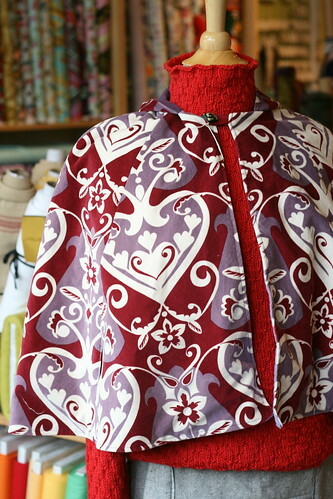 I used Anna Maria Horner's Innocent Crush Velveteen for the exterior and Kaffe shot cotton for the inside. Even though it is sized for a child, it could easily be modified to fit an adult by lengthening it slightly and by enlarging the armhole slits so they hang open all the way down to the hem. The pattern was straight-forward and quick to sew together once I had everything cut out. 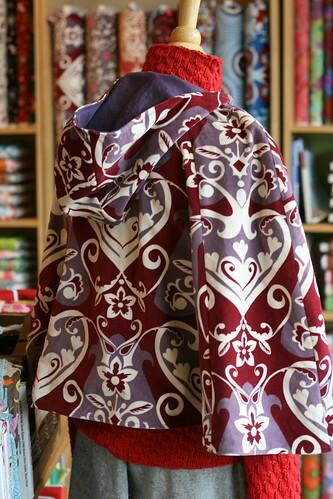 I made one small modification: I top stitched around the edge of the cape to ensure the velveteen stayed put. This would also be beautiful in wool with a super soft voile interior or a quilt weight cotton on the outside and a flannel on the inside. If you're itching for further motivation to check out this book, Erica is teaching the Messenger Bag (in child or adult size) pattern from this book down at Modern Domestic!